Reconstruction after the Civil Warexplores the role of former slaves during this period in American history. 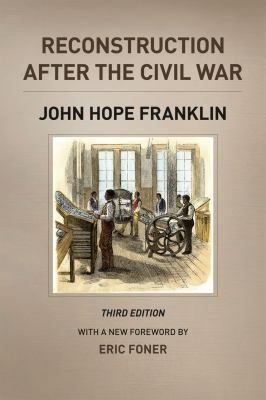 Looking past popular myths and controversial scholarship, John Hope Franklin uses his astute insight and careful research to provide an accurate, comprehensive portrait of the era. His arguments concerning the brevity of the North’s occupation, the limited power wielded by former slaves, the influence of moderate southerners, the flawed constitutions of the radical state governments, and the downfall of Reconstruction remain compelling today. This new edition ofReconstruction after the Civil Waralso includes a foreword by Eric Foner and a perceptive essay by Michael W. Fitzgerald. 21st Century (1993). His comprehensive history From Slavery to Freedom: A History of African-Americans (1947) is generally acknowledged to be the basic survey of African American history. He received numerous awards during his lifetime including the Medal of Freedom in 1995 and the John W. Kluge Prize for the Study of Humanities in 2006. He worked with Thurgood Marshall's team of lawyers in their effort to end segregation in the 1954 case Brown v. Board of Education and participated in the 1965 march from Selma to Montgomery, Alabama with Dr. Martin Luther King, Jr. He was president of the American Historical Association, the Organization of American Historians, the Southern Historical Association, and the American Studies Association. He was also a founding member of the Black Academy of Arts and served on the U.S. Commission for UNESCO and the Committee on International Exchange of Scholars. He died of congestive heart failure on March 25, 2009 at the age of 94. Eric Foner is a professor of American history at Columbia University.